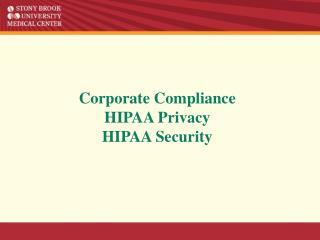 HIPAA Privacy & Information Security. Overview. What is HIPAA and why should I care? 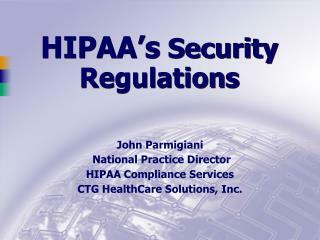 HIPAA is the Health Insurance Portability and Accountability Act of 1996. 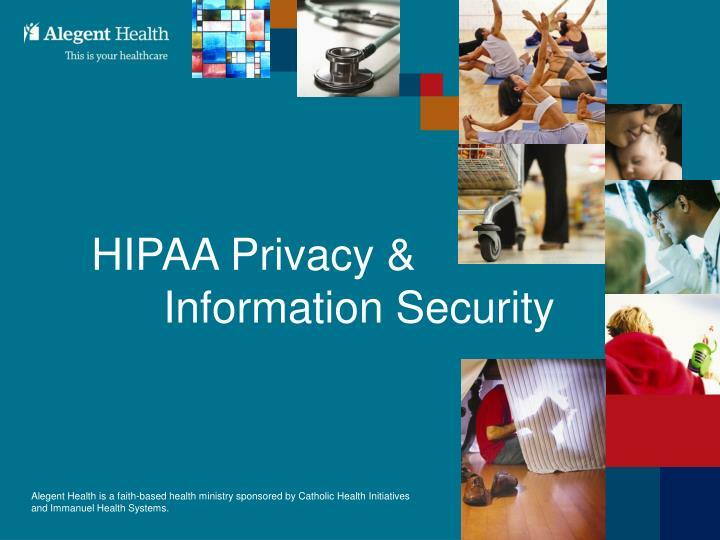 This presentation will focus on those sections of the law related to Privacy and Information Security as it applies to Alegent Health. 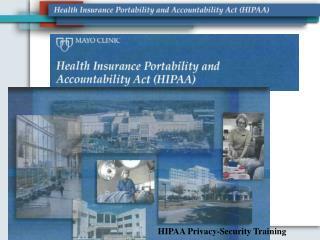 HIPAA is the Health Insurance Portability and Accountability Act of 1996. 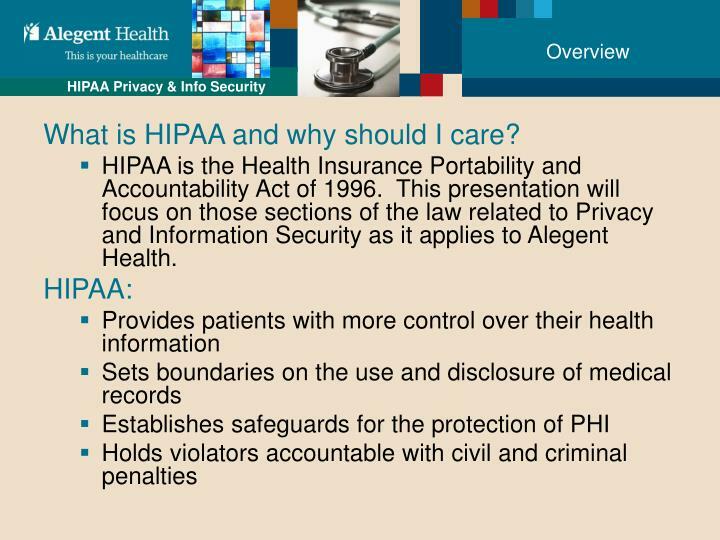 This presentation will focus on those sections of the law related to Privacy and Information Security as it applies to Alegent Health. 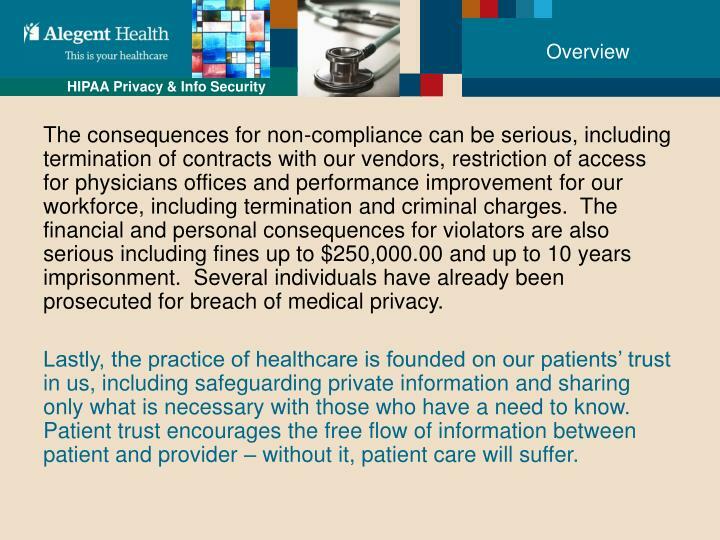 The consequences for non-compliance can be serious, including termination of contracts with our vendors, restriction of access for physicians offices and performance improvement for our workforce, including termination and criminal charges. The financial and personal consequences for violators are also serious including fines up to $250,000.00 and up to 10 years imprisonment. 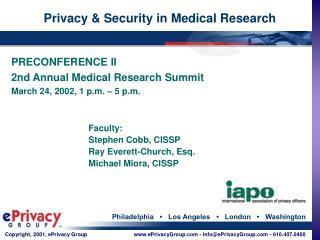 Several individuals have already been prosecuted for breach of medical privacy. 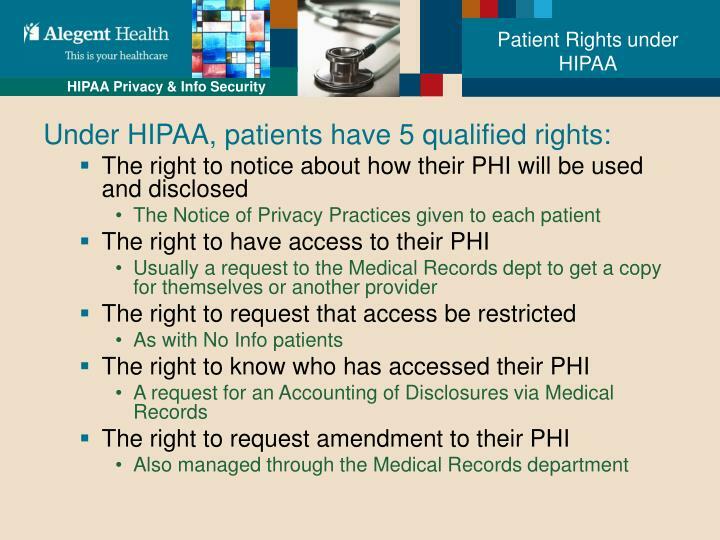 Lastly, the practice of healthcare is founded on our patients’ trust in us, including safeguarding private information and sharing only what is necessary with those who have a need to know. Patient trust encourages the free flow of information between patient and provider – without it, patient care will suffer. 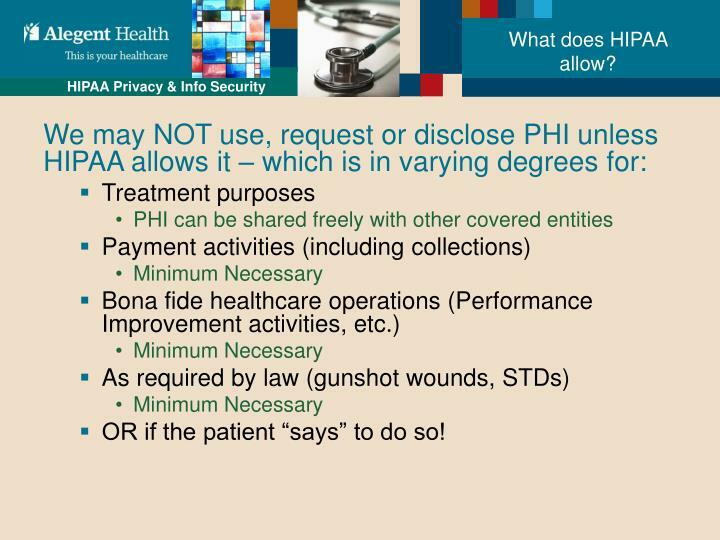 PHI – What is it? 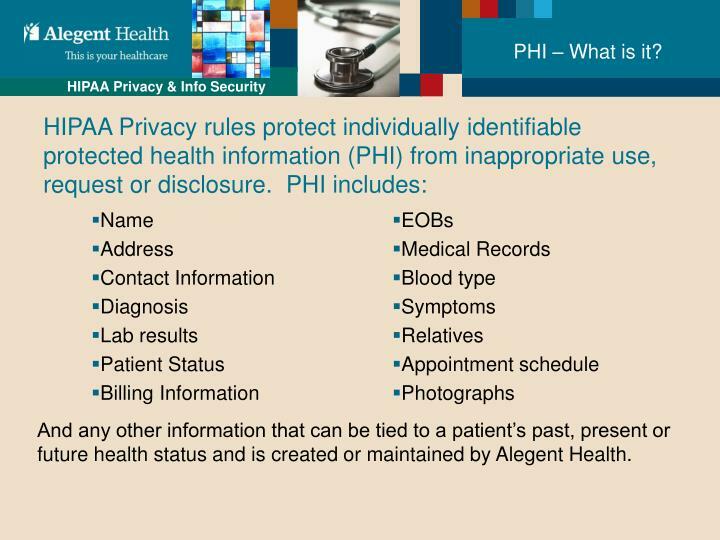 And any other information that can be tied to a patient’s past, present or future health status and is created or maintained by Alegent Health. 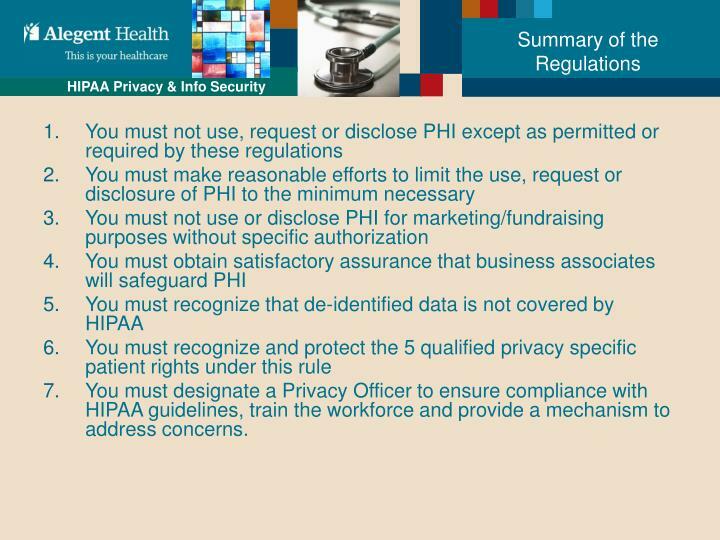 You must designate a Privacy Officer to ensure compliance with HIPAA guidelines, train the workforce and provide a mechanism to address concerns. OR if the patient “says” to do so! 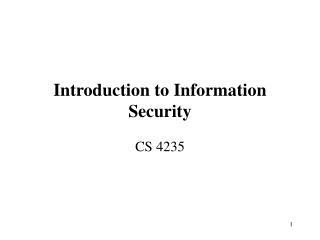 This information can only be disclosed in response to a request – we cannot offer it to anyone without them asking us for it. 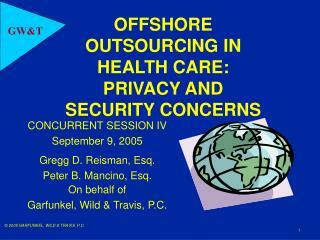 Disclosures of this nature should be directed by the patient whenever possible. As long as an adult patient is awake and competent, it is best to simply ask them for permission to discuss/disclose the information, and document the permission. 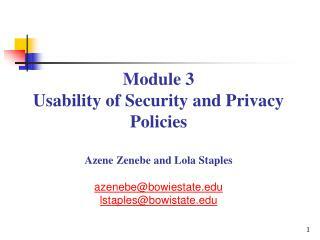 Privacy regulations include oral communication as well as paper and electronic. 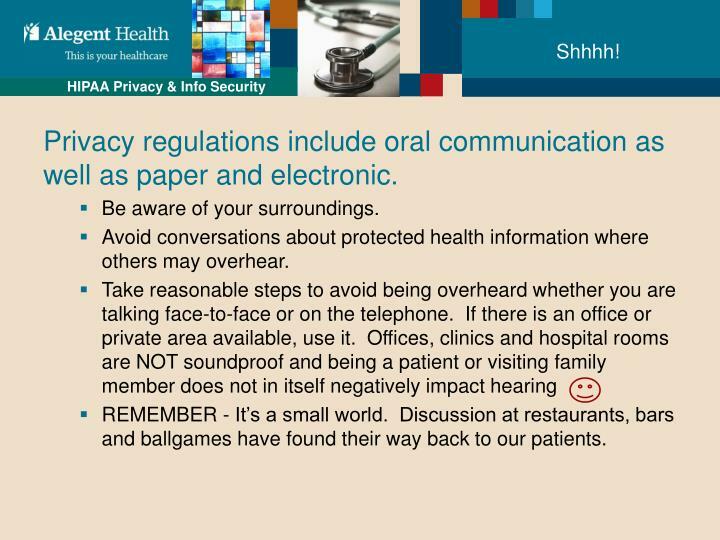 Avoid conversations about protected health information where others may overhear. REMEMBER - It’s a small world. 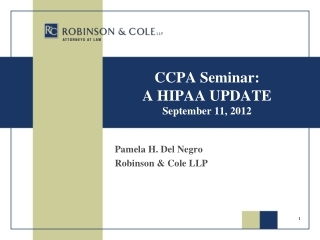 Discussion at restaurants, bars and ballgames have found their way back to our patients. 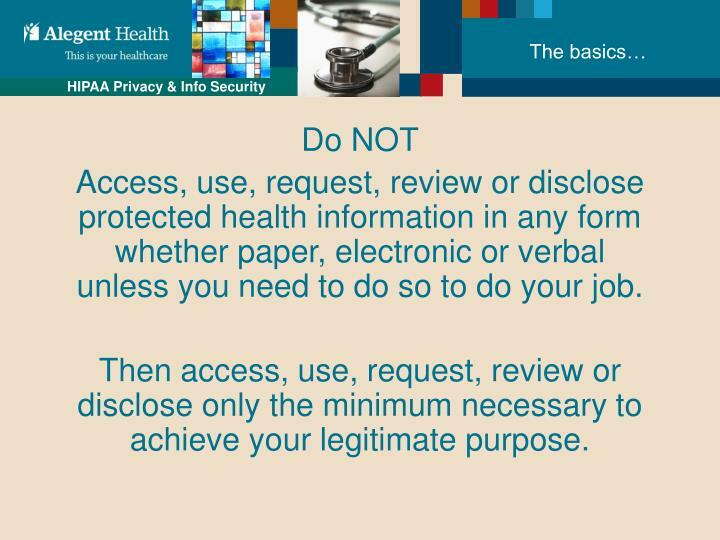 Access, use, request, review or discloseprotected health information in any formwhether paper, electronic or verbalunless you need to do so to do your job. 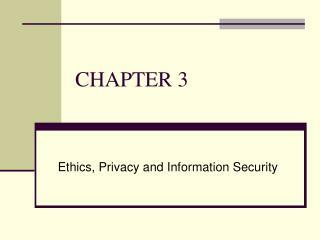 Then access, use, request, review or disclose only the minimum necessary to achieve your legitimate purpose. Use only your own login and password, and never let anyone else use them. Protect them as you would if they accessed your bank account! Never sign into an application on a computer where someone else is logged in. 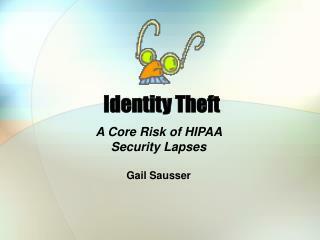 This will cause your logins to be linked and could lead to inappropriate access on their part being attributed to you. Log off or “flag out” when you walk away from the computer. 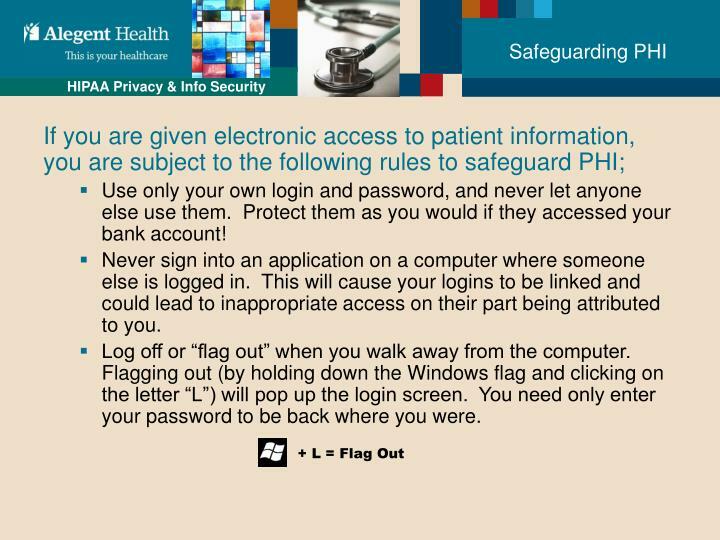 Flagging out (by holding down the Windows flag and clicking on the letter “L”) will pop up the login screen. You need only enter your password to be back where you were. 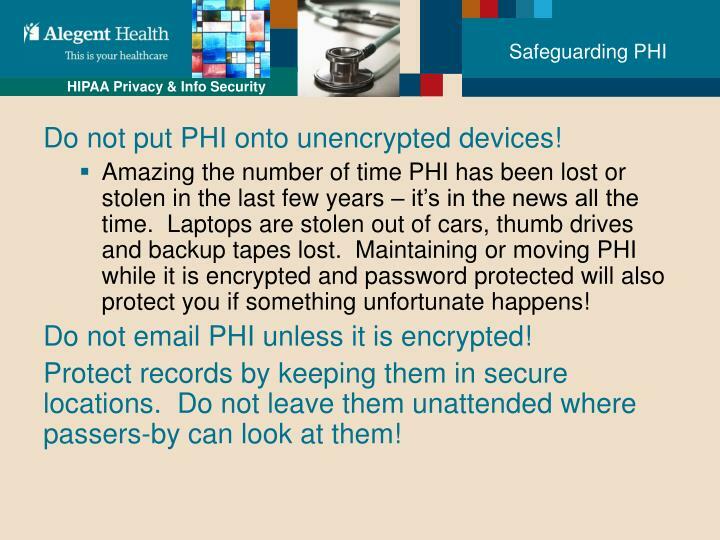 Do not put PHI onto unencrypted devices! Amazing the number of time PHI has been lost or stolen in the last few years – it’s in the news all the time. Laptops are stolen out of cars, thumb drives and backup tapes lost. 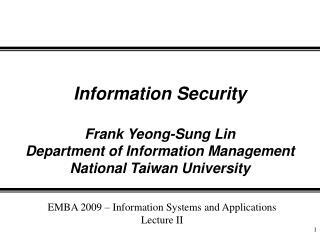 Maintaining or moving PHI while it is encrypted and password protected will also protect you if something unfortunate happens! 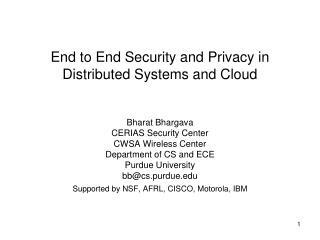 Do not email PHI unless it is encrypted! Protect records by keeping them in secure locations. Do not leave them unattended where passers-by can look at them! 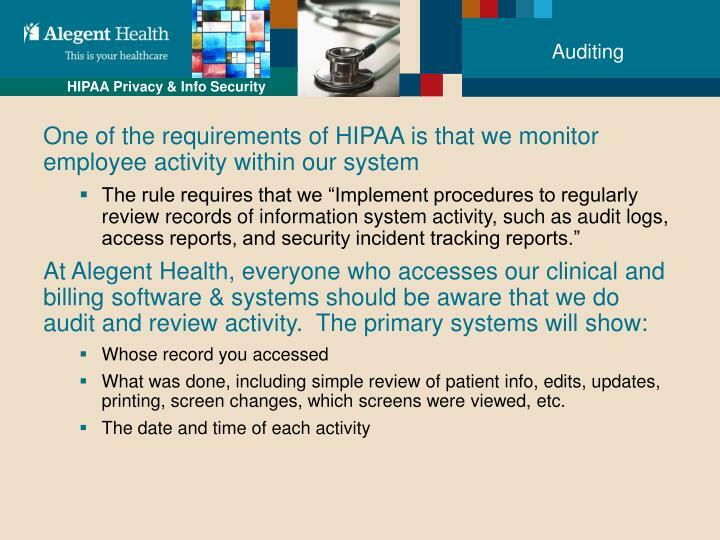 What was done, including simple review of patient info, edits, updates, printing, screen changes, which screens were viewed, etc. 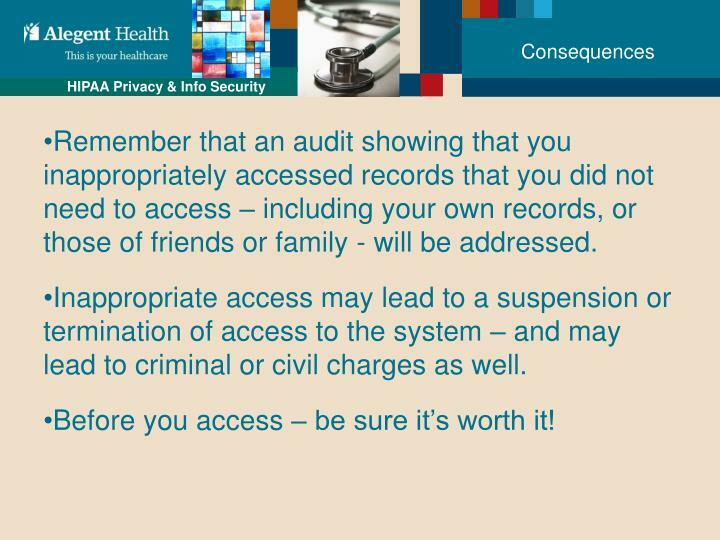 Remember that an audit showing that you inappropriately accessed records that you did not need to access – including your own records, or those of friends or family - will be addressed. 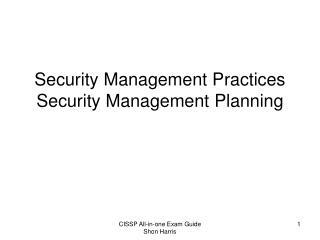 Inappropriate access may lead to a suspension or termination of access to the system – and may lead to criminal or civil charges as well. Before you access – be sure it’s worth it! Joe heard that his grandmother was in the hospital. He called the hospital to find out her condition. Can her condition be disclosed? Yes. 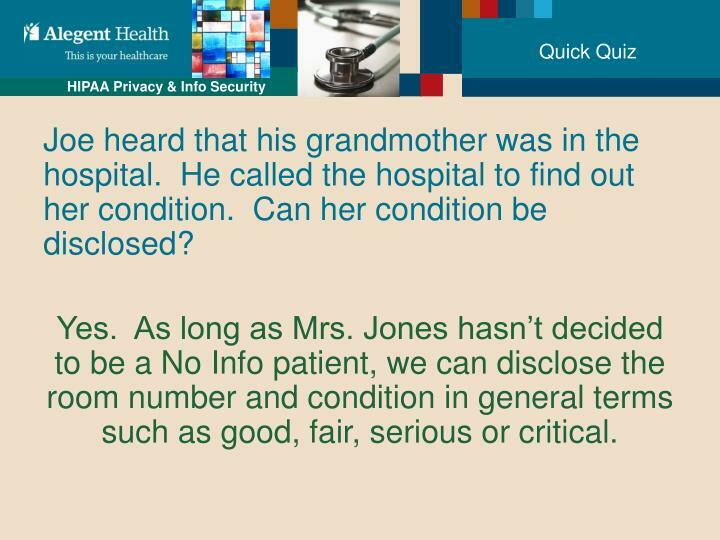 As long as Mrs. Jones hasn’t decided to be a No Info patient, we can disclose the room number and condition in general terms such as good, fair, serious or critical. 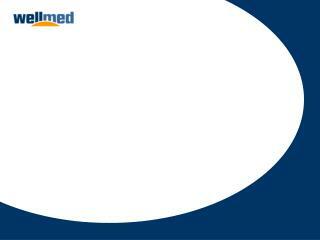 A person calls you, identifying themselves as the spouse of a patient. 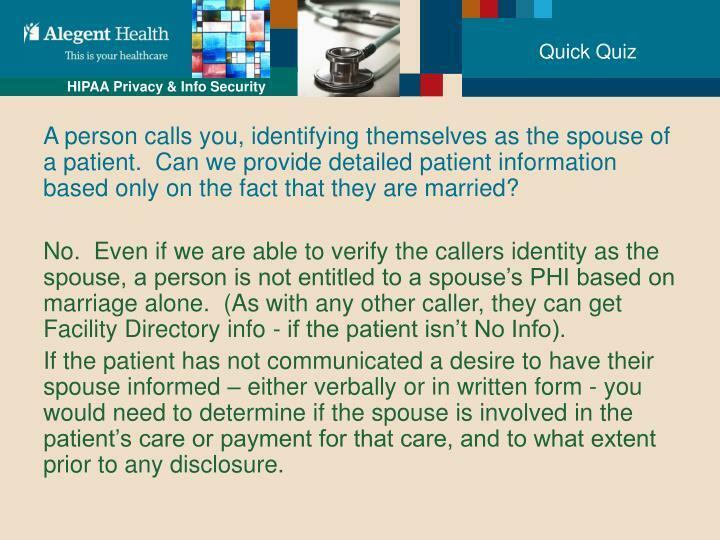 Can we provide detailed patient information based only on the fact that they are married? No. Even if we are able to verify the callers identity as the spouse, a person is not entitled to a spouse’s PHI based on marriage alone. 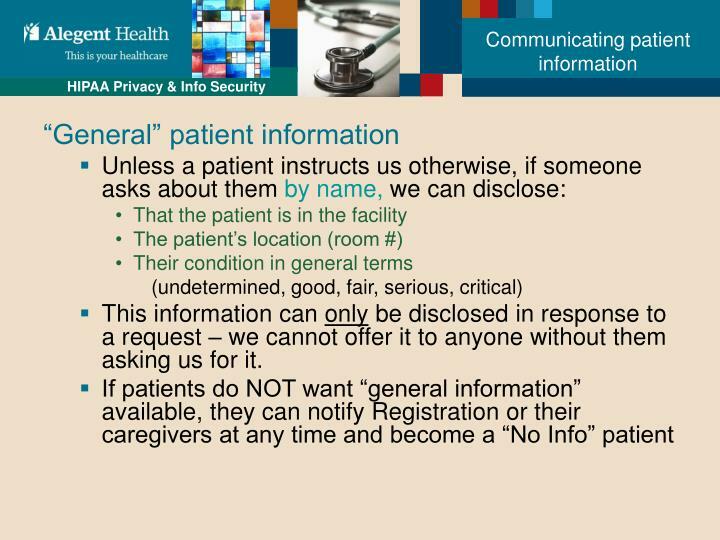 (As with any other caller, they can get Facility Directory info - if the patient isn’t No Info). 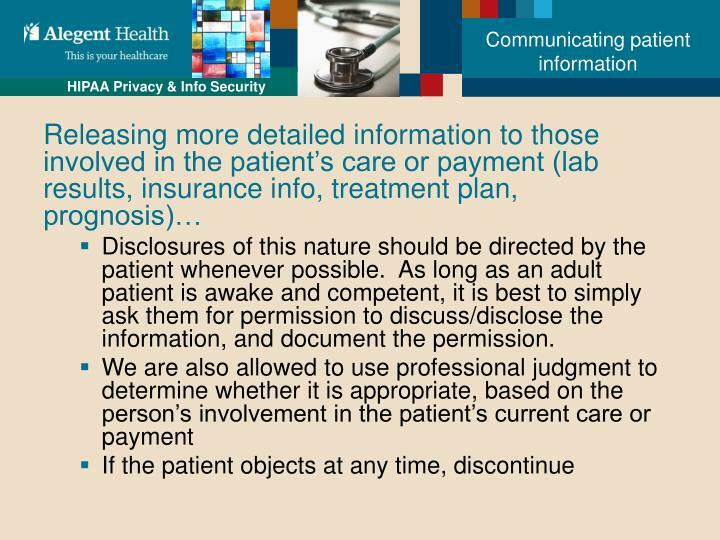 If the patient has not communicated a desire to have their spouse informed – either verbally or in written form - you would need to determine if the spouse is involved in the patient’s care or payment for that care, and to what extent prior to any disclosure. 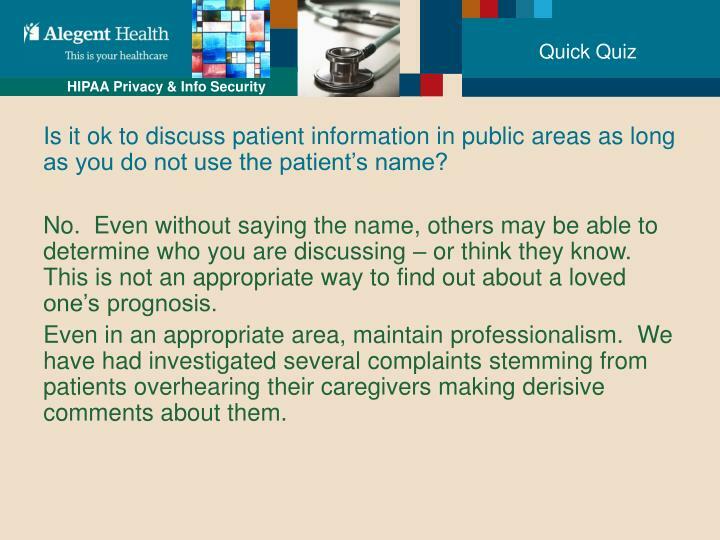 Is it ok to discuss patient information in public areas as long as you do not use the patient’s name? No. Even without saying the name, others may be able to determine who you are discussing – or think they know. This is not an appropriate way to find out about a loved one’s prognosis. Even in an appropriate area, maintain professionalism. We have had investigated several complaints stemming from patients overhearing their caregivers making derisive comments about them. 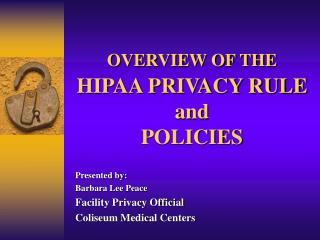 Is looking up patient information out of concern or curiosity ok, as long as you don’t disclose what you see to others? No. 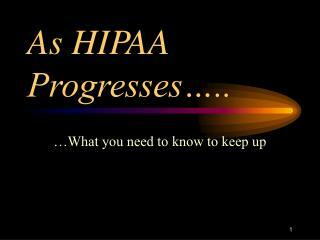 Access patient information only when you have a legitimate, work related need to know. 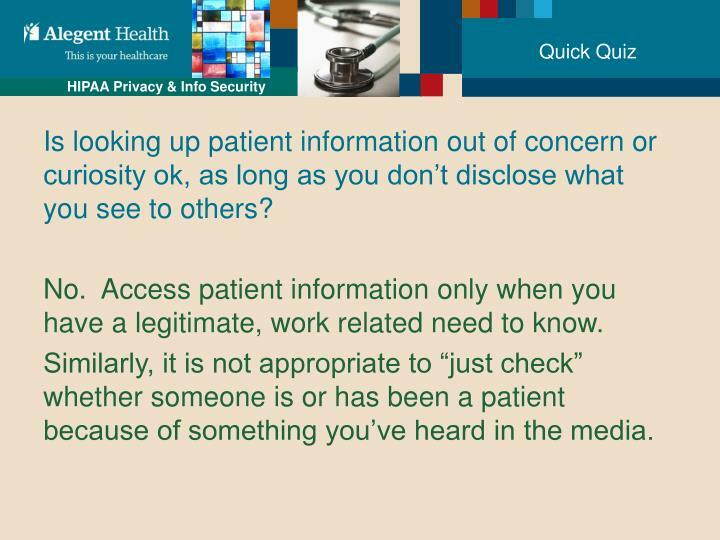 Similarly, it is not appropriate to “just check” whether someone is or has been a patient because of something you’ve heard in the media. You are at work and see a friend as you walk down the hall. You stop and say hello. They tell you that they are in for tests and you wish them well and go on your way. When you get home, can you tell anyone about your friend’s tests? No. 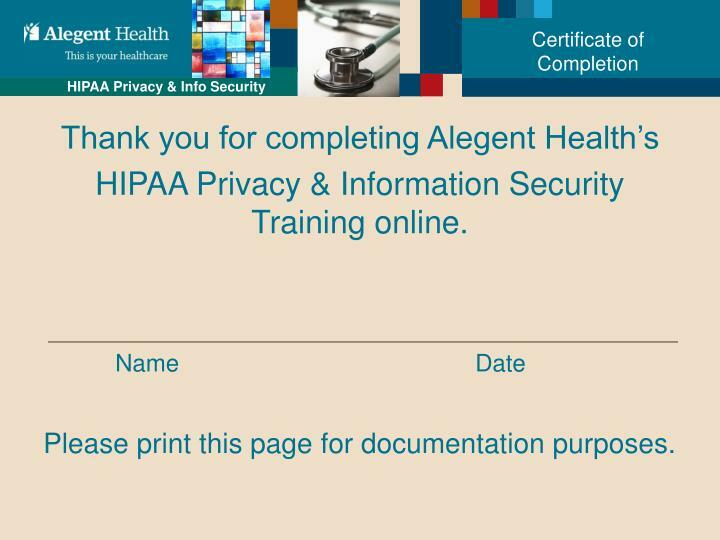 Any information that you gain while you are working as a member of Alegent Health’s workforce or while visiting one of our sites must be treated confidentially. 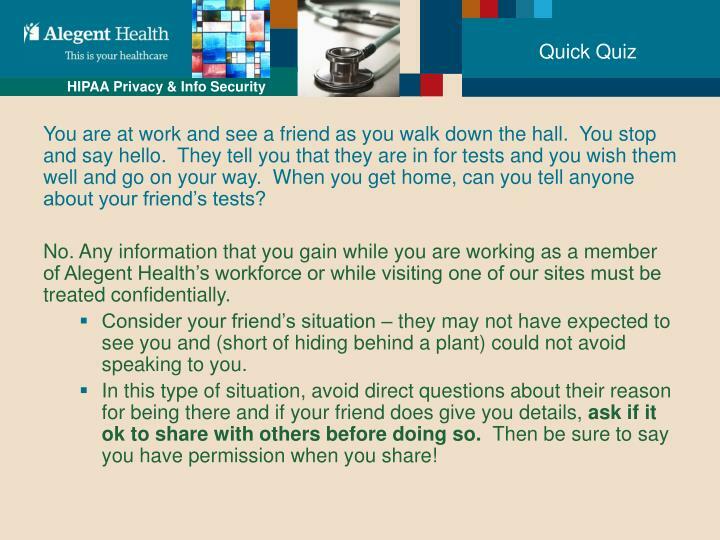 Consider your friend’s situation – they may not have expected to see you and (short of hiding behind a plant) could not avoid speaking to you. In this type of situation, avoid direct questions about their reason for being there and if your friend does give you details, ask if it ok to share with others before doing so. Then be sure to say you have permission when you share! 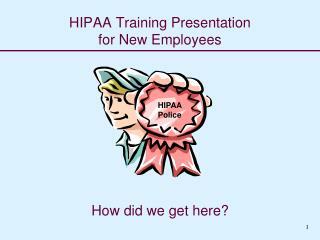 HIPAA Privacy & Information Security Training online. 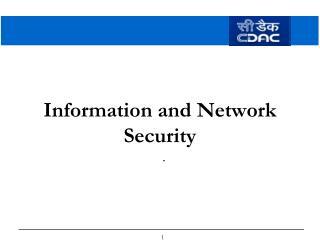 Please print this page for documentation purposes.